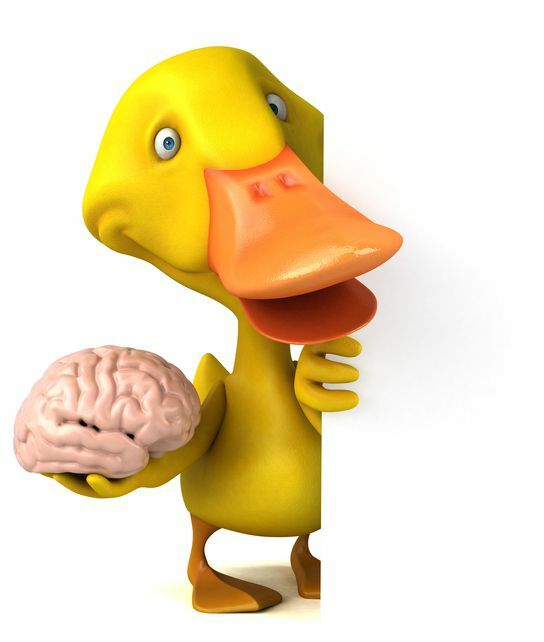 Is Your "Quacking Duck" Stealing Your Brain!? In a recent meeting a leader mentioned a difficult situation with another leader. The purpose of this meeting was to share highlights of a recent successful project, but her natural instinct was to begin the interaction with a negative comment that set the tone for the entire meeting. Our team accomplished all our goals but this seemed to have slipped her mind. Her choice was to focus on a negative incident that happened months before. It reminds me of the times when my son jogs my memory about the one time I drove over a curb with him in the car! I am guilty as charged so if I mention I am a pretty darn good driver, he is sure to giggle with a reminder of the day I nearly lost our muffler. I normally respond, “Who has safely delivered you to and from school?” Dad he responds! We share the driving but I think you get my drift. Some beliefs are hard to change! My choice is to breathe, step back, and count to 10 to calm the trigger of negativity, gain perspective, staying aware of how our brains work. Both my son and the meeting leader are being truthful in their perception because their brains are wired to dwell on the times and situations that have not gone to plan, not on the countless times it did! Perhaps my son and fellow leader do not remember all the other positives! We are born with a “negativity bias", a tendency to focus more on the negatives than the positives - in ourselves, in others, and in our circumstances. This negativity bias is triggered from memories of the past, present and often when forecasting the future. In all cases, this focus on the negative tends to dampen the past positive experiences and energy. As leaders we need to be aware of both triggering our teams negative reactions, and be aware of how we respond to our critics. This negativity bias was put in place to protect us so serves as a strong evolutionary purpose. Our brains are attuned to the dangers in the environment to survive natural threats. But long gone are prehistoric times so leaders must be the pivotal catalyst and models for setting the stage for positive team and work environments. The majority of us do not need an increase in inner and outer criticism but instead could use an injection of positivity and an emphasis on a growth mindset. This negative mind chatter in coaching circles is often referred to as the quacking duck or our gremlins! The good news is running into a sabre-toothed tiger on your way to work, or when driving your kids to school or a real attack in a meeting is pretty slim, so it may be wise to reflect, breathe, take a big picture approach and be aware that your negativity bias may be a catalyst to evoking the quacking duck in yourself and others! How do you know if you have a quacking duck? You received overwhelmingly positive feedback for something yet you find yourself fixating on the one or two criticisms? You focus on that one client who rejected your offerings? You are upset with your partner for doing something wrong forgetting the many things he did right!? If you are feeling any of the these emotions; anxiety, anger, hopelessness, resentment, boredom, judgement against yourself and others, chances are your inner critic and quacking duck have been fed some false beliefs, or you’re having a difficult time forgiving and letting feedback be a gift to growth. This is an entirely different subject for another blog! Feedback is just that - feedback. As a coach I have learned there is a truth and an agenda in everything, you need to find your truth and learn from this. So back to the quacking duck! Shawn Achor, author of The Happiness Advantage, wrote, “We can retrain the brain to scan for the good things in life — to help us see more possibility, to feel more energy, and to succeed at higher levels!" Social scientists have found that it takes five compliments to make up for one criticism, and depending on the situation, it may be longer! Here’s an awesome exercise from my CALM Power Coaching that helps calm the quacking duck! This is the problem part - write briefly about the situation that went or could go badly. Write down what you're likely to do because of what happened or you think will happen. (For example, you might avoid similar situations, the people who were there, or be very worried if you have to try the same thing again. Ask yourself is this true or not true? Have a heartfelt conversation with yourself about your beliefs - most negative beliefs are overreactions. Look for other reasons why things turned out as they did. If you are stuck, hire a coach! Notice the change in your, beliefs, thoughts and feelings & emotions when you successfully challenge your negative beliefs. Negativity zaps your energy while positive energy is about an upward spiral of positivity! I am an experienced ICF Certified Executive Leadership and Career Coach with the honor of helping countless emerging leaders like you discover their leadership and career visions to overcome disengagement to emerge strong!"